I'm a huge fan of bubble baths. I take them whenever possible -- which, unfortunately, has been scarce over the past five years as my bathroom only has a stall shower. (Luckily, my roommate's bathroom has a tub.) I find them to be utterly relaxing, especially after a long and stressful work week. And nothing makes it better than Space NK Life NK Midnight Milk Soak. A blend of lily, geranium, violet, cedar and vanilla notes bring peace, calm and tranquility to the tub. 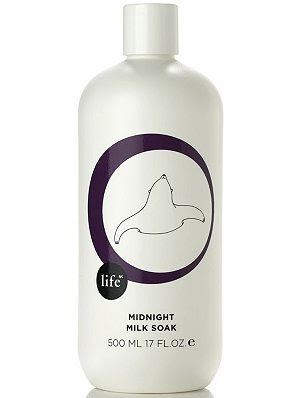 One lucky winner will win a bottle of Space NK Life NK Midnight Milk Soak today, valued at $30! To enter, simply place your name and email address in the box below. The winner will be selected on Tuesday, August 10 and notified by email. This giveaway is open to US residents only. Giveaway runs until Monday, August 9 at midnight. One entry per person, email address and IP address. Multiple entries will be disqualified.